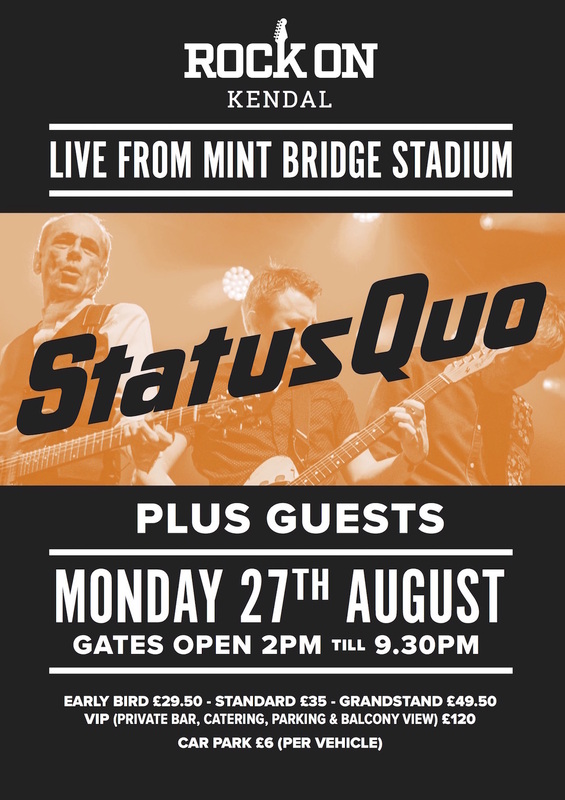 Status Quo LIVE at Kendal Rugby Club - 27 August 2018 - Kendal R.U.F.C. Tickets are available online via MINTBRIDGE, TICKETLINE and BREWERY ARTS, where you can also turn up, pay cash and collect your ticket from the Box Office! 2017 saw STATUS QUO performing across the world, bringing the fans what they wanted and keeping that flame burning. The band performed at the Royal Albert Hall, Sydney Opera House, Wacken and Glastonbury, closing the year out with the Aquostic Live – It Rocks! Tour of Europe and the Plugged In: Live & Rockin’ tour of the UK. Those live dates are to be the last tour dates for a while, in 2018 the band will take some time out and perform only at one-off gigs and festivals, there will be none of the traditional touring. Connecting with the fans in 2017 has been really important: in a year like no other, tinged with sadness, the power of music really shone through. Some incredible 'Quo facts from over the years!